The new Saeco Royal One Touch is the rejuvenation of a trusted classic. What remains unchanged is the extremely solid performance and the generous tanks for beans, water and coffee grounds. The new Saeco Royal One touch offers adjustable coffee length and intensity, a clean machine thanks to the auto-clean and descaling prompt, double boiler for instant steam: two independent circuits assure quick and convenient coffee preparation after frothing your milk. Ergonomic in day-by-day operationsSaeco is a synonym for convenience: refilling beans or water, emptying the coffee-dump box or the drip tray, all compartments of the full automatic coffee machine are directly accessible.Large capacity containersSaeco Royal One Touch Cappuccino is always ready to brew all your preferred coffee specialties, with high productivity and limited daily operations. The size of the water tank, bean container, coffee dumps box and drip tray is perfect for your enjoyment all day long, even in frequent usage. 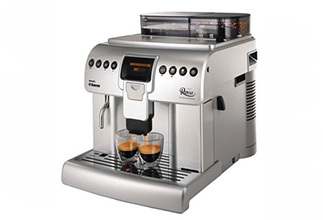 One touch beverage selection makes the preparation of your favourite coffee and milk specialties a One Touch matter. With the integrated automatic milk frother, all your favourite beverages are just one touch of a button away!